And Now you can purchase Gift Certificates to use in the Rented Mule Home and Garden Store! It doesn't get any easier than that! Adding Decorative Accesssories to your home and garden completes the look. Accessories are the finishing touches to the home improvement project. Notice the links in the DECORATOR TIPS areas on the description of the items on this page. The links take you to pages within this website featuring home and garden projects that you can do yourself. See Links below to other pages of the store. 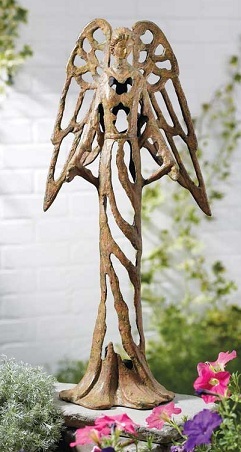 DECORATOR TIPS - This angel statue would be beautiful indoors on a table or plant stand. Drape a floral garland gently flowing down and around the base. Outside in the garden place her on a pedestal or plant stand over looking YOUR beautiful flower gardens. 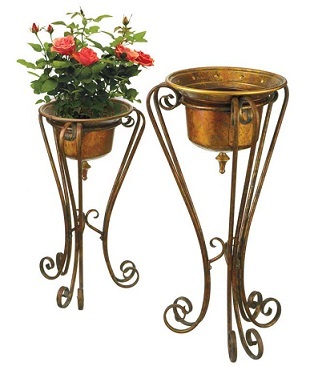 DECORATOR TIP - Outside -Place These plant stands on your porch or Patio. They would also be great inside in a sunroom, or any room with lots of natural light, so you could have live plants indoors. DECORATOR TIP- for the home - use this item over a garden tub for a romantic glowfrom candlelight. 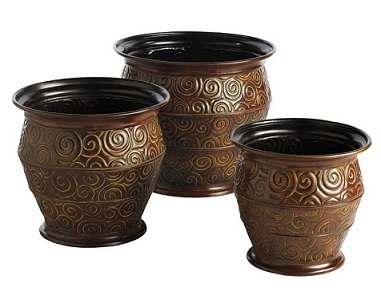 DECORATOR TIP - Outside -these nesting planters would be great on the countertop of an Outdoor Kitchen with your favorite flowers planted in them. Place all 3 together for a beautiful floral collection. Inside place them on the hearth of a fireplace during warm weather with silk or live plants inside. Group them together. 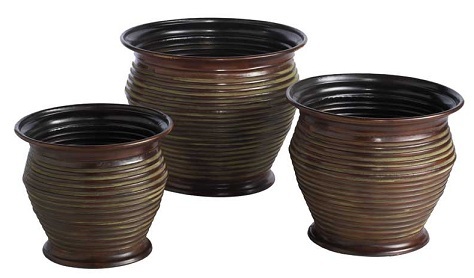 2 styles of nested Planters are the same price! Each style is a 3 pc set. DECORATOR TIP - Either set of planters would be perfect for transplanting an outdoor plant to bring inside for the winter. Use in your kitchen, or on the porch! Or anywhere in between! 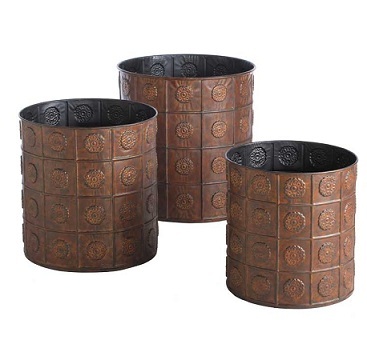 Beautiful classic designs of spirals and ribbed pattern, works with a modern or traditional decor. DECORATOR TIP- Inside - This wall planter is very large and would look great as a pair -one on either side of a oval or rectangular mirror over a large buffet or fireplace. Outside- hang this planter on a brick wall of the house in an Outdoor Room. Such as a deck or patio area. Or if you have a wooden fence decorate it with planters about 10 foot apart all the way down the fence line. Use live plants trailing out of it. That would be gorgeous! Share the photos and story with us on one of the pages within the website. There are over 30 pages with invitations! Incuding one on Backyard Privacy. We have flower seeds from our private garden, Scrappy Signs made from Reclaimed KY Barnwood, home decor, and garden decor. We accept Paypal so you can shop with confidence! Don't miss the special savings Free Shipping on Signs and 6 Pk Specials on Freda's Favorite Flowers. Dreaming of working for yourself? Do you wonder how others are doing it? I want to inspire you, the way I was inspired when I learned about SBI. ARE you holding yourself back - because you feel that you don't know where, or how, to get started on the road to self employment? Start living YOUR dream today. Read on, to find out how you can work for yourself and experience the " SELF EMPLOYMENT IS SELF EMPOWERING" feeling that I have. Learn from SBI like I have done. If you are wanting to have an online business that YOU - CAN DO YOURSELF, so you can work from home, consider this. Make a site that is all about a subject you are knowledgeable about,or passionate about, like I have done. See the case studies of SBI owners that have successful web businesses.My passion is home and garden improvements. I love working on my home. And,I am my happiest in my garden. I have enough experience regarding home improvements, decorating and landscaping - through my real life experiences over the years, to consider myself knowledgeable enough to inspire others to improve their homes too. I get compliments on my home and landscaping. That helps build confidence. I also have confidence in my abilities. I KNOW that I can do it. I bet you do too. After all you are probably a DIYer like me, if you are looking at this site! My work history is also in home related sales, so the background is set. What are you good at? What do you enjoy doing? What do you get compliements on, or asked by others - How did YOU do that? Think about it, I bet you have a hidden gem (a skill) that you are not even thinking about. SBI can help you find it. They have the Brainstorming tools needed to get you moving in the right direction, on your way to owning a REAL online business that is profitable. With SBI I was able to figure out the perfect business that makes work fun. Because I now love what I am doing. Read more about me, and get my story. I have had a great time developing this website with the help of SBI. I supply the drive and motivation, and SBI supplies ALL of the technical necessities. And they do All of that for less than $1.00 a day! SBI is an amazing value! And now I have a wonderful site that I am proud to share with my DIY visitors. Check out SBI for yourself today - while they have a free trial offer. If you have any questions about a project you are working on, or considering starting, let me know. I will also be happy to help you with any questions on products you are shopping for from this site. I will be happy to assist you with your questions. Just Let Me Help You! I promise to use it only to send you Improve Your Home and Garden Newsletter.